Mother is bringing dessert. I hope she will be careful and not trip on the toy car! Despite dropping a couple of sprigs of her holly garnish, everything smells and looks very festive, including the window in the background with its garland of greens and berries. A glorious partridge in shades of taupes and whites is perched amongst two plump, ripe pears with holly and large green leaves. The background is black and has a top border of a red and white candy cane stripe. This is a beautiful stocking! This is a companion to Bobbie's Harlequin stocking and her Table Runner pattern in the December 2004 issue of Dollhouse Miniatures magazine. Santa's arms are full of goodies! He is carrying a small tree with a star on the top. In his basket is a tiny doll and a stuffed horse with a candy cane in its mouth. A Christmas ornament dangles from his hand and at his feet is a wooly white lamb all decked out with his holly collar. This stocking has a Scandinavian flavor with the pattern on the top border, heel and toe, yet is perfect for any décor or era. Santa is wearing a red hat with white trim and his beard is naturally white. The background is Christmas Green. Perfect for any member of the family. This whimsical stocking is in the style of a child's drawing. It features a pudgy very pale blue snowman with white highlighting on his belly. He has brown twig arms, an orange carrot nose, and black coal eyes and buttons. He is wearing a bright green hat and has a brown pipe in his mouth. He stands behind a rather scrawny green bush. 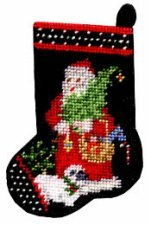 The background of the stocking is Christmas red with a white and green top border. A delightful stocking for the children of the household.